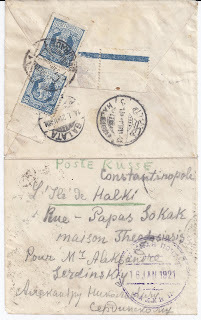 In previous Blogs, I have written about the (White) Russian Post in Constantinople which existed before the evacuation of Crimea at the end of 1920 and which facilitated the delivery and onward despatch of mail from White controlled south Russia and Ukraine which came to Constantinople from the Black Sea ports. This Russian Post was clearly facilitated by the Allies who had Occupation forces in Turkey after the end of World War One. This Russian Post was the basis of the idea for a Refugee Post which never, however, translated into a real postal service. The opened out cover above is addressed to Alexander Sredinsky [his name spelt wrongly on the cover] who was Postmaster both of the Russian Post and later the would-be Refugee Post. The letter started out in BELGRADE 3 XII 20, arrived in Turksih GALATA 14 1 21, and was sent on to Turkish HALKI. All this information is on the reverse. It was common at this period for postal officials to clarify an address by underlining the important bit in crayon. For example, on mail from Russia to Germany and German-controlled areas in 1918, officials used blue crayon to underline town names. This blue crayon was probably applied in the Koenigsberg transit office. On this cover, the destination “Ile de Halki” has been underlined in green crayon, just the kind of thing a Galata arrival office clerk would have done faced with a messy address. It’s enough to get the letter into the bag destined for Halki. But in the same green crayon, there is written “POSTE RUSSE”. Now the interesting question is this: Did a Turkish clerk in Galata use this green crayon, adding the words “POSTE RUSSE” to clarify the destination still more, or did Sredinsky enhance the cover by doing the green crayon work himself? In the same way, it would have been Sredinsky who applied the 16 JAN 1921 KHALKI receiver cancellation of the RUSSKAYAR POCHTA – normally associated with Refugee Post covers. The letter is non-philatelic and simply an item of personal mail addressed to Sredinsky who enhanced it with the Russian Post cancel of Khalki. But maybe the green crayon is Turkish and shows that postal officials were aware of who Sredinsky was and what he was doing. So: does anyone have clearly Turkish green crayon from 1920? My vote goes to Sredinsky deciding to make the envelope more interesting. The main reason is that there is a perfectly good Turkish Halki arrival marking. So what is supposed to be the story here, the Turkish post decided to hand over the letter to this unofficial and illegal "Russian Post" for conveyance to the addressee, because he had a Russian name? Nope, no buying it. And since Sredinsky forged "Russian refugee post" covers on a massive scale and clearly had his hands on the postmarks, the simple explanation is that he decided to make this ordinary cover to into yet another faked "proof" for his unpleasant little business venture. Occam's razor!